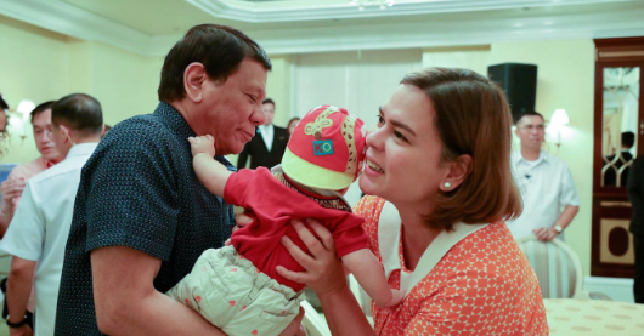 President Rodrigo Duterte on Friday said the Filipino people can count on his daughter Davao City Mayor Sara “Inday” Duterte-Carpio, weeks after the 73-year-old leader floated again the possibility of ceding power early. Speaking to Filipino community in Jordan, Duterte said he hopes Sara, whom he described as the “alpha” of his family, could fulfill his unmet promises once he steps down. “I won here, 73 percent of you voted for me. So I will remember that for all time. And if I fail to make good on my promises, I hope in little ways, Inday, she’s a mayor, she might be in the future,” Duterte said in a mix of Filipino and English. “You can come to her. Inday is good. She’s capable,” he added. Last month, Duterte, whose family is an influential clan in Davao City, said Sara is not running for a national post next year despite her strong survey numbers. According to a nationwide poll conducted in June, 46.2 percent of respondents said they would support the presidential daughter, giving her a statistical ranking of 3rd to 5th. Sara was behind Sen. Grace Poe, Taguig City Rep. Pia Cayetano and Sen. Cynthia Villar. The younger Duterte has said she was overwhelmed by the survey results but has yet to announce her plans for next year. In a speech last August 15, Duterte said only a successor like former Sen. Ferdinand “Bongbong” Marcos Jr. or Sen. Francis “Chiz” Escudero, both defeated candidates for vice president, would make him leave office. Escudero, who ran alongside Poe, conceded defeat in 2016 and is a member of the Senate majority. The dictator's son and namesake Marcos Jr., meanwhile, is in the middle of an electoral protest against Vice President Leni Robredo, whom he has accused of cheating in 2016. Duterte has rejected the idea of Robredo replacing him despite the constitutional provision that states the vice president shall become the president in case of death, permanent disability, removal from office or resignation of the president.